SANAA, Yemen -- Hours after Saudi Arabia threw its support behind former Yemeni president Ali Abdullah Saleh, who was once allied with the country's Houthi rebels, those rebels announced that they had killed Saleh and said the country's war-torn capital was united under their Iranian-backed insurgency. In messages posted online, Yemen's Interior Ministry, which is run by the Houthis, said Saleh had been killed in fighting in Sanaa, and posted video purportedly showing his dead body in the back of a truck, with a gunshot wound to the head. Officials from various sides, including the Houthis' opponents, have confirmed that the video shows the former powerful president. Abdel-Rahman al-Ahnomi, a top Houthi media official, told The Associated Press that Saleh was killed near Marib, the eastern province bordering Saudi Arabia. "He was trying to flee to Saudi," he said. The video, apparently shot by one of the attackers, showed a Houthi crowd picking up Saleh's dead body, wrapped in a colorful blanket, off the ground and lifting it onto a pickup truck. Saleh's eyes appear wide open, the back of his head badly injured, and his shirt blood stained under a dark suit. A senior Yemeni government official affiliated with Houthis' rivals and some of Saleh's associates, such as Nabil al-Soufi and Ali al-Bukhiti, confirmed his death on social media and TV interviews. Fighting erupted between the Iranian-allied Shiite Houthi rebels and forces loyal to Saleh last week. The breakdown of the fragile alliance has led the U.S.-backed, Saudi-led coalition to step up its bombing of Houthi positions, in support of Saleh's forces, in a major realignment that leaves the rebels increasingly isolated after three years of war. Saleh's apparent killing -- yet to be verified by Saleh's own backers or the international coalition -- came as Saudi jets pounded Houthi positions in the capital. Tribes who supported Saleh have tried to assert control over their areas across the city, while the internationally recognized president, Abed Rabbo Mansour Hadi, has ordered his Saudi-allied forces to march north toward the capital. Yemenis huddled in basements across Sanaa overnight as airstrikes echoed across the city. Suze van Meegen, Sanaa-based protection and advocacy adviser for the Norwegian Refugee Council, said the violence left aid workers trapped inside their homes and was "completely paralyzing humanitarian operations." "No one is safe in Sanaa at the moment. I can hear heavy shelling outside now and know it is too imprecise and too pervasive to guarantee that any of us are safe," she said. "The night was tough," Robert Mardini, the regional director of the International Committee of the Red Cross, posted on his Twitter account. "Massive urban clashes with heavy artillery and airstrikes. Yemenis stuck in their homes, too scared to go out. Reduced access to water, health care, food and fuel." The Houthis and forces allied to Saleh swept into the capital, Sanaa, in 2014. The Houthis dominated the northern part of the city, while Saleh's forces held the southern part, with much of the current fighting concentrated around the Political District, home to ministries and foreign embassies. The Houthis appeared to be targeting the homes of Saleh's family, political allies and commanders. Civilians living in the area are largely cut off from the outside world. In southern Sanaa's Fag Attan neighborhood, the Houthis used tanks, artillery, and anti-aircraft guns to try to take out snipers loyal to Saleh, damaging or destroying several buildings. Residents said the night was shattered by the sounds of gunfire and children screaming. "It's like horror movies," said Bushra, a local woman who asked that her last name not be published for fear of retribution. "I have lived through many wars but nothing like this." Witnesses said the bodies of slain civilians and fighters littered the streets, as no ambulances were able to reach the area. The ICRC says at least 125 people have been killed and some 240 wounded in Sanaa since the fighting began Wednesday. The Saudi-led coalition launched an air campaign against the rebels in March 2015 and later expanded into ground operations. Saudi Arabia views the Houthis as an Iranian proxy on its doorstep, and the rivalry between the two regional powers has amplified the conflict. Iran supports the Houthis but denies arming them. The stalemated war has killed more than 10,000 civilians and displaced 3 million. Even before the fighting, Yemen was the poorest country in the Arab world. It is now on the brink of famine and grappling with a cholera epidemic. In the latest fighting, the coalition threw its support behind Saleh, dubbing his fight against the Houthis a "popular uprising." Witnesses said airstrikes hit the airport and a military camp in northern Sanaa, the district controlled by Houthis. From Riyadh, President Hadi has ordered his forces to march to Sanaa, according to a statement posted by the official news agency Saba. The statement said the president has called on his forces to "open several fronts" to enter Sanaa "to put an end to the militias of the coup and Houthi patriarchs and those supporting and financing them." Houthi spokesman Mohammed Abdel-Salam said the coalition is targeting Houthi positions in support of Saleh's forces, saying the coalition now has "agents in the middle of Sanaa, directing the jets of the aggression." Mohammed Ali al-Emmad, the chief editor of a Houthi-linked newspaper, said the fighting between Saleh and Houthis, also known as Ansar Allah, is a "belated battle." "From day one, Ansar Allah knew that Saleh was a traitor," he said. He claimed the group had "recordings and evidence" that Saleh had reached out to the coalition through back channels months ago. "He has been exposed and he is living his last days," he added. 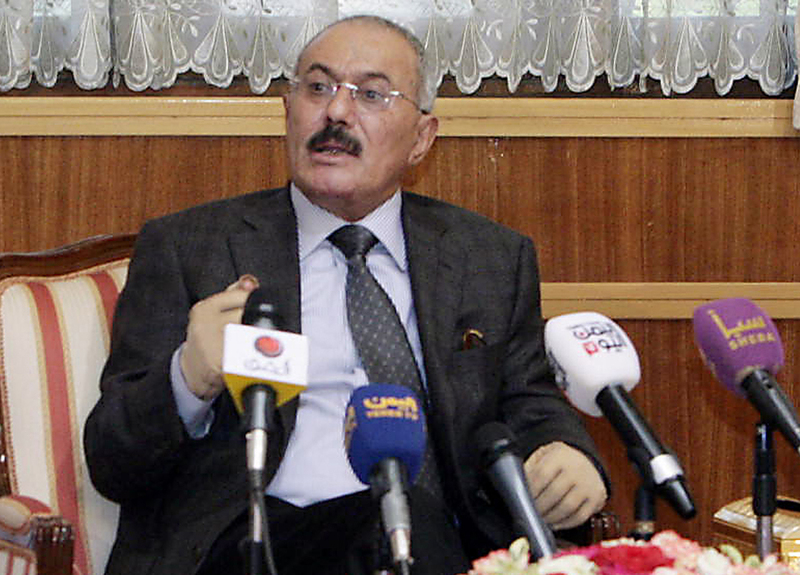 Saleh ruled Yemen for more than three decades until he was forced to resign following an Arab Spring uprising in 2011. He remained in the country, however, and continued to wield power from behind the scenes. In 2014, his forces allied with the Houthis despite the fact that as president he had gone to war with them on more than one occasion. Jamie McGoldrick, of the U.N. Office for the Coordination of Humanitarian Affairs, described the fighting in Sanaa as "another dark chapter of life here." Speaking from Sanaa, McGoldrick said that humanitarian agencies are close to the front lines and that aid workers are also sheltering in basements. He called for a humanitarian pause to the fighting to allow civilians to escape.